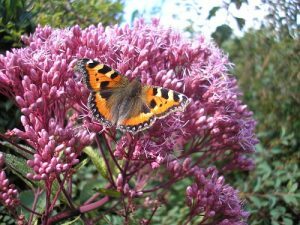 Spotted Joe-Pye Weed … A butterfly/bird magnet! This family of plants is hardy and easy to grow and comes in a wide variety of heights. I especially like Spotted Joe-Pye Weed which grows 5 – 6 ft tall. Attracts butterflies like crazy! A vigorous and sturdy native plant to our area. Deer and rabbit resistant as an added bonus. Blooms pink in late summer, early fall. 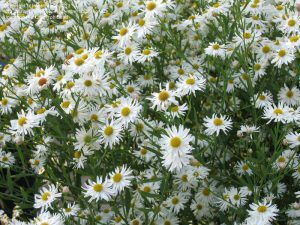 Boltonia’s cheery daisy-like flowers! Great used in masses. A profusion of white daisy-like flowers covers its 4 – 6 ft tall frame in September and October. Pretty blue-green foliage adds to this attractive plant’s appeal. Easy to grow in full sun to part shade. Pinch back in early summer for a bushier effect. Looks great planted in masses. Cheery personified! 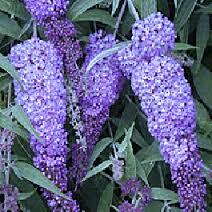 Butterfly Bush ‘Nanho Blue’. Fragrant & good for cutting. There are many varieties of Butterfly Bush, but this is one is a tried and true favorite. Nanho Blue features showy panicles of fragrant blue flowers at the ends of the branches from mid summer to mid fall. The flowers are excellent for cutting. It has grayish green foliage throughout the season. Besides butterflies it also attracts hummingbirds. Reaches 5 – 6 ft tall at maturity. Also available in dwarf form. Helianthus ‘Lemon Queen’. Good pollinator plant! This variety is a softer yellow, easy to grow, and does not require much water. Grows 6 – 8 ft. tall and reseeds easily. Hardy Hibsicus ‘Summer in Paradise’ adds a tropical vibe. 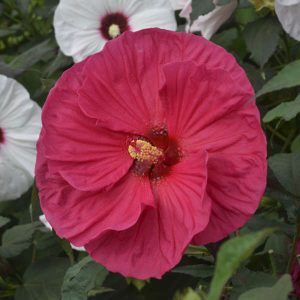 The gorgeous, large, tropical-looking blooms of the hardy hibiscus are a perfect focal point to the garden bed. They are best planted in full sun. Don’t be alarmed … they are slow to break dormancy and often don’t show signs of life until June. ‘Summer in Paradise’ is a new variety featuring luscious hot red blooms from July – Sept. 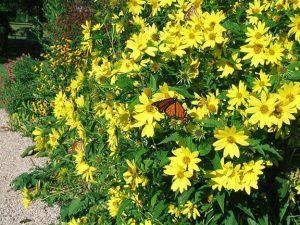 Reaches 3 – 5 ft. tall in moist well-drained soil. Sunset Hyssop features hummingbird loving coral spiked flowers. 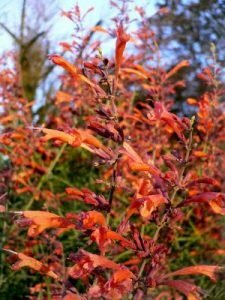 I adore plants with orange-coral flowers and this lovely perennial surely fits the bill! 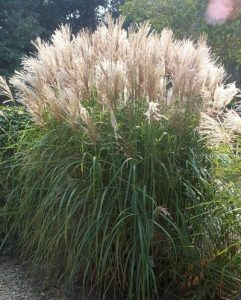 Miscanthus is one tough plant adaptable to a range of conditions from dry to wet. 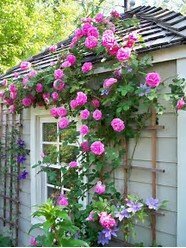 They provide winter interest and then come spring … cut them down to a few inches from the ground. 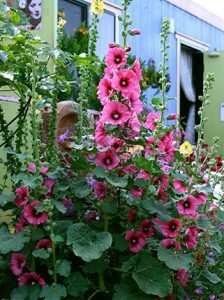 Hollyhock ‘Halo Cerise’ reminds me of old-fashioned cottage gardens. They come in many hues … one of my favorites is ‘Halo Cerise’ in rich pink with a contrasting deep purple halo. Oriental Lily ‘Casa Blanca makes a wonderful bouquet! 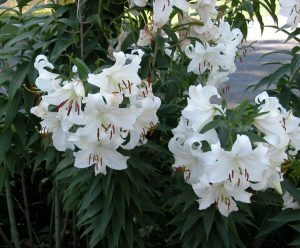 The lilium family of asiatic and oriental lilies features a large group of summer blooming plants which grow from a bulb. The Oriental varieties are extremely fragrant adding to their appeal. Russian Sage – Very reliable & drought tolerant. 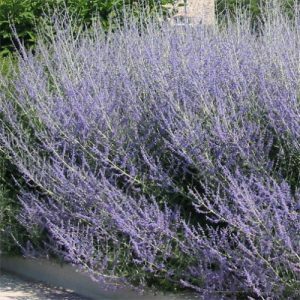 Always reliable in the garden as an anchor plant or in back of lower growing perennials and annuals, Russian Sage has richly aromatic silver foliage with airy spikes of lavender-blue flowers. Drought tolerant when planted in well drained soil, this perennial prefers full sun to look its best and keep it blooming July – October. Plants can reach 2 – 4 ft tall. Of course, the above list just scratches the surface of the wonderful world of tall perennials! Don’t just consider the maximum height of these plants … research the spread too so you know how much room they can take up in your garden. 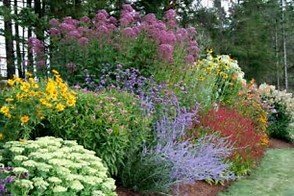 Seasonal flow from foliage to flower to autumn hues and winter interest are the hallmarks of many large perennials. Turn a ho-hum spot into a charming one with tall perennials!